Nebbiolo grapes the pride of Piedmont. The picture was taken in La Morra Bricco dell’Annunziata visiting Aurelio Settimo winery producer of Barolo wine…A family run estate, the owner welcome people with a big shake of the hand and a lovely smile. Wellington boots, trousers all tugged up.. she has just been in the field monitoring the grapes. 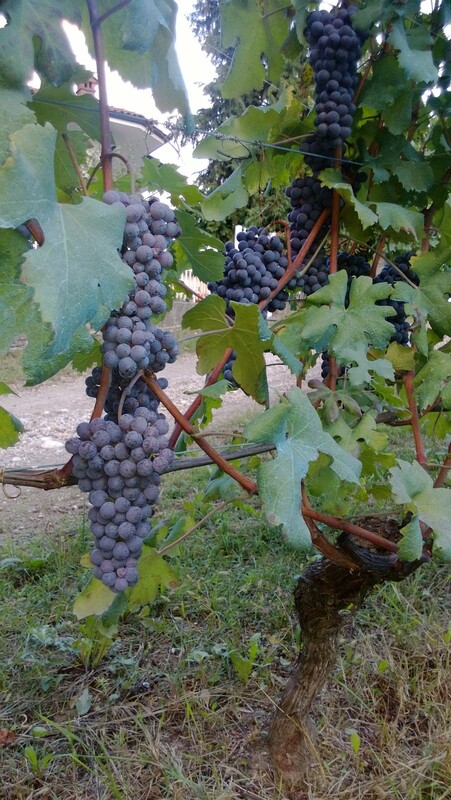 Nebbiolo is normally harvest mid of October, it reaches maturity quite late compare to other varieties: thin shin, generous bunches, extremely tannic. Despite the very dark skin it makes very pale wine, the tannin however remains, it becomes Barolo after 4 years in big barrels, 7 years for the reserve. Fascinating variety… the wine produce can last for decades.